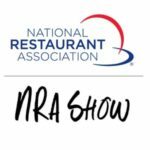 The National Restaurant Association (NRA) Show will be held this year from May 19th until May 22nd at the McCormick Place in Chicago, IL. Join us for this 4 day event! Be sure to stop and see us at Booth # 1410! Fill out the form below to reserve your FREE NRA show pass. Very limited passes, be sure to sign up early!